Home News Make this Summer Epic with Sea Ray! Make this Summer Epic with Sea Ray! 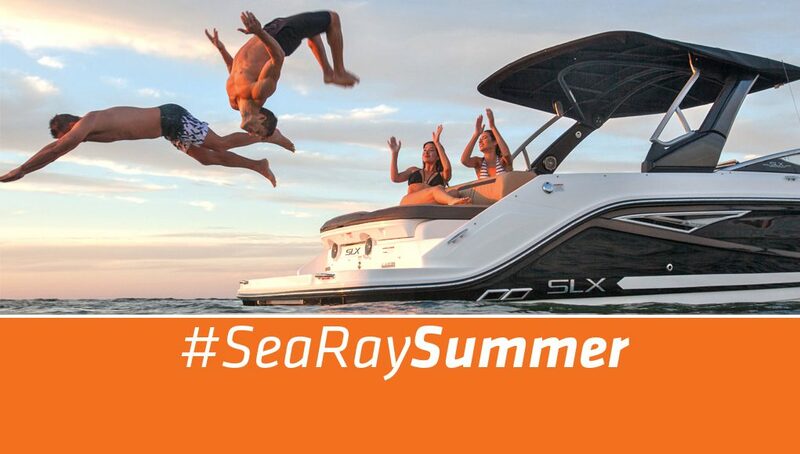 Sea Ray wants to help make this your most epic summer ever. All season long, Sea Ray dealerships all across North America are hosting thrilling events as part of the #SeaRaySummer promotion. Check out popular models like the spacious and social Sundeck and Sundeck Outboards; the sophisticated, iconic Sundancer lineup; the sporty and accessible SPX models; and the SLX series of luxury sport boats — and see for yourself why Sea Ray has earned its status as boating’s Most Awarded Brand. Sea Ray’s commitment to Orchestrated Excellence is exemplified by the new SLX series. Every detail works in perfect harmony to improve your boating experience, from the plush upholstery to the cutting-edge propulsion technology and beyond. Plus, Sea Ray is offering huge savings across the entire lineup – meaning there’s no better time than right now to embark on your most epic summer ever. With more engine choices, more outboard and sterndrive models, and more horsepower options than ever before, Sea Ray has the boat that perfectly fits your on-water lifestyle. Make this season memorable: Make it a #SeaRaySummer.